The option of supplying Kiev with “lethal defensive weapons” is on the table, Barack Obama said in a joint press conference with Angela Merkel. However, the German chancellor reiterated there is no “military solution” to the conflict in eastern Ukraine. 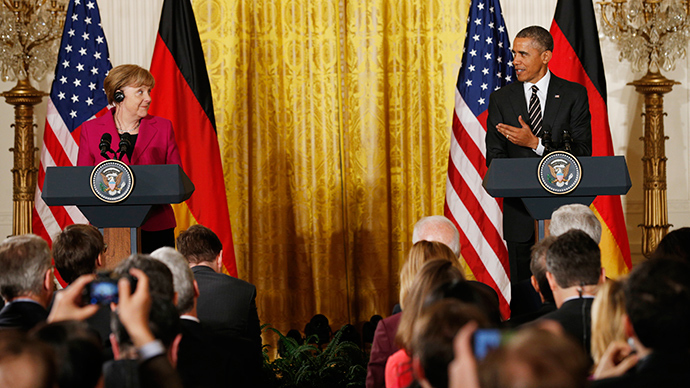 “The possibility of lethal defensive weapons is one of those options that’s being examined,” the US president said during a joint press conference with Merkel in Washington. Merkel – who conducted direct negotiations with Vladimir Putin in Moscow last week, alongside French President Francois Hollande – struck a less antagonistic, if equally firm, tone. “We continue to pursue a diplomatic solution, although we have suffered a lot of setbacks. But, I've always said I don't see a military solution in this conflict,” she said through a translator. Merkel may fly to Minsk on Wednesday for four-way talks that will include Ukraine, Russia, Germany, and France, in another attempt to resurrect the increasingly irrelevant ceasefire roadmap signed back in September. “I myself, actually, would not be able to live with not having made this attempt,” said Merkel, who still accuses Moscow of “violating” the initial terms of the Minsk treaty and continuing support to anti-Kiev rebels. Yet both leaders appeared somewhat skeptical at the prospect of a diplomatic solution. “If, at a certain point in time, one has to say that a success is not possible, even if one puts every effort into it, then the United States and Europe have to sit together and try and explore further possibilities, what one can do,” admitted the 60-year-old German chancellor. Yet despite admitting some tactical disagreements, the two leaders tried to present a common front. “Russian aggression has only reinforced the unity between the United States, Germany and other European allies,” the president said. “There’s going to continue to be a strong, unified response between the United States and Europe – that’s not going to change,” said Obama. “For somebody who comes from Europe, I can only say, if we give up this principle of territorial integrity, we will not be able to maintain the peaceful order of Europe. It's essential,” said Merkel, condemning Crimea’s secession from Ukraine, as well as the splintering of the Donetsk and Lugansk regions. Moscow has always rejected accusations of military involvement in Ukraine, and says it will not accept any negotiating ultimatums from the West. “The Ukrainian crisis was not caused by the Russian Federation. It emerged in response to the attempts of the US and its western allies – who consider themselves ‘winners’ of the Cold War – to impose their will everywhere,” Putin said in a recent interview with Al-Ahram. The Ukraine conflict began last April when Kiev sent regular forces and volunteer battalions to the southeastern Donetsk and Lugansk regions, after people there refused to recognize the country’s new, coup-imposed authorities. The death toll in the Ukraine conflict has exceeded 5,300 people, with over 12,000 injured, according to UN estimates.